The state must provide institution residents who want community placement with an individualized, independent evaluation, and the opportunity to live in the community with appropriate services. Over a six-year period, the state must move any of the approximately 6,000 institution residents who want placement in the community to the most integrated, community-based setting appropriate for them and consistent with their personal vision, preferences and strengths. The state must not interfere with the placement of people who are happy where they are and must provide them with enough resources to meet their needs. Over a six-year period, the state must provide community services to 3,000 people with developmental disabilities living at home without adequate services. The state must quickly provide services in the most integrated, community-based setting to all people with developmental disabilities who are in crisis. Read our News Release to learn more about the Ligas case. The state must provide interested IMD residents with independent evaluations, information about community living, and the opportunity to live in the community (including permanent supportive housing) with appropriate services. The state must not interfere with the placement of IMD residents who are happy where they are. Over a five-year period, the state must move all IMD residents who want placement in the community into the most integrated, community-based setting appropriate for their needs and consistent with their personal vision, preferences and strengths. Read our News Release to learn more about the Williams case. The state must allow people to receive services in the least restrictive environment appropriate to their needs. In the first 30 months, the state must provide housing assistance to allow more than 1,000 people in nursing facilities to move into housing in the community. The state must ensure that people who want to remain in nursing facilities will be able to do so. The state must develop community-based services and housing for people moving out of nursing facilities. Read our News Release to learn more about the Colbert case. People are not eligible for community services because the state says their disability is either too severe or not severe enough. People’s services are being reduced or eliminated because the state says they no longer need the same level of service – or any service. People are receiving community services, but they need advocacy to get more or different services because otherwise they are likely to be sent to an institution. 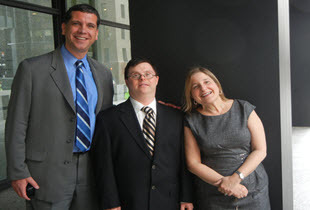 Community integration is central to our mission, so we will continue to take cases, both individual and systemic, to promote the rights of people with disabilities to live in the community.